It's Friday! And round two visitors arrive today! Yea! We're still exhausted from round one lol but ready for round two. This group doesn't have passports so no Jost or Willie T trips for them. But no worries. 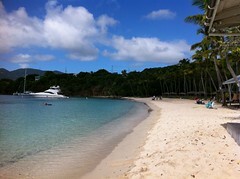 Plenty of beautiful places to go around St. Thomas, St. John, Water Island, Hans Lollick, you get the picture. I'm sure we'll be hanging out a bunch at Joes Beach Bar on Water Island (pic above) which is cool because we haven't been there in awhile. Watch out Water Island, here we come!